Salmon Run is a co-op multiplayer mode available in Splatoon 2 for up to four players. It can be played via local multiplayer (local wireless or LAN) at The Shoal, or online via Grizzco Industries during certain time slots. The online version requires the player to be at least level 4 to be able to play. Each Salmon Run consists of three waves; to complete waves, players must collect Power Eggs and Golden Eggs by defeating Salmonids and depositing them at the egg basket. Each Boss Salmonid splatted yields three Golden Eggs; if they are not picked up, a Snatcher will appear after a few seconds to retrieve them. Each player can carry only one Golden Egg at a time. Each wave has a quota, which varies depending on the number of players present. If the quota is not filled before the wave timer ends or if all players are splatted, they will fail the run. Completing a run will increase the player's pay grade, which also determines the difficulty of runs. If they fail, players are still paid for the Golden Eggs they collected, but their pay grade may be reduced. The highest possible quota is 21 - 23 - 25 for waves 1, 2 and 3 respectively, when the difficulty is at its highest. This happens when the squad's average rank is Profreshional 600 or above. A message will appear on-screen at the start of such a shift stating "Hazard Level MAX!!". Inklings and Octolings in this mode are equipped with special gear that allows them to be revived if they are splatted. When splatted, a lifesaver will appear at their last position after a few seconds. By inking it, a teammate can revive them and they come back with a short period of invulnerability. If they collected a Golden Egg before being splatted, it will not be lost. Additionally, if they did not have a Golden Egg before being splatted, they may pick one up while in a lifesaver. However, eggs cannot be deposited in the egg basket until they are revived. Each player is provided a different main weapon for each wave, and two uses of one special weapon to last all three waves. These include the Inkjet, Sting Ray, Splashdown and Splat Bomb Launcher. There are also various special waves called Known Occurrences, such as Fog and Rush. In Salmon Run, Inklings' and Octolings' Ink level and special weapon uses are displayed visually. The lifesaver on their back replaces their Ink Tank, but fills up to reflect their Ink level. Their special weapon stock appears as two silver packets strapped to their hat, which disappear as special weapons are used. When one of the squad is down, or when there are fewer than four active players, the box surrounding the squid or octopus icons will glow in orange to alert this. When the counter reaches 30, the timer number will start to appear in yellow and if the quota is not yet met, the box surrounding the timer and quota will glow in orange as a warning. During the last 10 seconds a separate countdown will appear in the middle of the screen as an overlay, with the color of the numbers being orange if the quota is not met, or green if the quota is met. Salmon Run is not always playable online, as the Grizzco Industries building can sometimes be closed. It opens in an irregular pattern, but can be expected to be available every other day. Each Salmon Run rotation features one random stage and four random weapons to be assigned to players. The stages menu shows the opening times of the next five Salmon Run rotations, with the stages and weapons shown for the next two. Due to the rotations being laid out in advance, newly-added stages and weapons may not appear for some time. All main weapons aside from variants can appear in a Salmon Run rotation. Main weapons and some special weapons loaned to players have different stats than their standard multiplayer counterparts. For these stats, see Salmon Run data. A wildcard rotation as it appears in the schedule. There are two types of wildcard rotation. During the first kind, the weapons loaned to all four players are random and not known until the start of a wave. During the second kind, three weapons are pre-set, and the fourth is a wildcard slot. Rare weapons appear only at the random slot(s). There are no limits as to how many players can be using the same weapon at once (including rare weapons and repeats of the pre-set weapons in a partially wildcard rotation), and the player can receive the same weapon multiple times in a game (again, including rare weapons). As of 4.0.0, a song called Frantic Aspic by ω-3 will play in place of Deluge Dirge during these rotations. These weapons cannot be accessed when playing Salmon Run at The Shoal. On occasion, a wildcard rotation will have golden question marks instead of the normal green ones. This signifies that the supplied weapons will all be rare weapons. The first such rotation took place on 14 July 2018, and was announced in a Tweet citing a message from Mr. Grizz saying he could not get the standard weapons ready on time, so the shift will take place using only his personal belongings.During this event, special music will play. There are currently 7 different events in Salmon Run, with some having variants. There are 6 possible rank titles in Salmon Run, with Profreshional having 4 additional ranks depending on the player's point range introduced in version 2.3.0. The title's point range goes up by 20 points when a player makes the quota for all three waves. The point range goes down by 20 points if the first wave is failed, or by 10 points if the second wave is failed, or remains the same if wave 3 is failed. As of version 4.0.0, if there was a disconnected teammate or if a teammate contributed an insignificant number of Golden Eggs in relation to the total collected by the team, the player will only lose half as many points for the corresponding waves. As the point range increases, players are awarded titles. Titles are retained across Salmon Run rotations, but the point ranges are reset to the 40-point mark within the player's current title across Apprentice to Profreshional (0 - 99). If the player meets Profreshional 100, they will have their rank reset to the previous checkpoint of 100 points up to 400. As of version 4.0.0 players who are Profreshional 100 or above have the option to reset their rank to Profreshional 40, which is done by entering Grizzco and pressing the button. The Pay Grade will increase by 5% after every 20 point increase up to Profreshional 980 - 999. Completion of a round of Salmon Run grants players Grizzco Points, which they can redeem for bonus prizes at the window outside Grizzco. The reward amount is based on the number of Golden Eggs and Power Eggs collected and the player's current pay grade. The player's Job Score is equal to one point per Golden Egg plus one point for every 200 Power Eggs (rounded down), and the final reward is the Job Score times the player's Pay Grade (rounded down). Every 100 Grizzco Points (200 after reaching 1200 points in a rotation) earns the player one bonus "capsule," which come in different colors representing the type of the contents, or a piece of gear. The gear is selected from a list of items available only through Salmon Run, and is rotated every calendar month. The main ability of this item is randomly determined when the bonus is redeemed. It usually has three blank slots for sub abilities, but there is a random chance that the sub ability slots may come already filled. The pink capsule can contain any Grizzco gear that has been released, including gear from previous months. If the player receives gear they already have, they can either replace the old gear with the new version, or receive cash (if the new gear has no slots filled) or ability chunks (equal to the filled slots) instead. The most unclaimed bonuses a player can have at a time is 99; once the limit has been reached, any new bonuses will be lost. Bonus capsules can contain cash, meal or drink tickets, ability chunks, or Grizzco gear. As of version 3.2.0, players will no longer have to walk to Grizzco Industries to claim their bonuses. Gear No slots. One slot. Three slots. At 600 and 1200 points the player will earn a superbonus, which always contains the 10% chance reward. The type of superbonus capsule is fixed for the length of a rotation. After 1200 points the player will only earn gear, alternating between the current monthly gear and gear from previous months, until the rotation ends. The capsules of the rewards until the second super bonus are different for every player. Gear by the Grizzco Industries is obtained from rewards and a new piece of gear arrives on the first of every month. 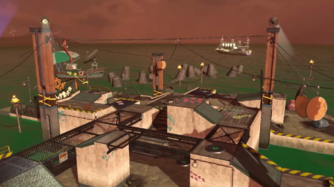 There is an option to play and host a Salmon Run locally at The Shoal, requiring other players having a separate console and copy of Splatoon 2 to participate. Local play is independent from the online Salmon Run rotation, thereby being available at all times. The host of a local Salmon Run has the ability to select which maps are played and set the hazard levels (not to be confused with the Pay Grade), which range from 5 - 200% as of version 4.0.0. Versions prior to this one had a range of 5 - 100% at start of a play session, where the players have to clear a match set at the highest hazard level to be able to gain the option to increase the difficulty by 10%, with 200% being the max limit. A hazard level of 100% is the equivalent to Profreshional 100, having a Pay Grade of 215%, meanwhile a hazard level of 120% equals to Profreshional 200 with a Pay Grade of 240%. Matches played in the local mode do not affect the rankings and battle records of the online version. Instead of Mr. Grizz a character known as "Raspy Voice" comments during matches, having the same dialogue as Mr. Grizz. At the end of the result screen, there isn't any dialogue present, unlike the online version of Salmon Run. Players are able to choose the weapon that they will play with during a match, with a selection screen being similar to the Equip screen. There is also an option to choose a random weapon. The weapons that are available to use aren't tied to the weapons that are purchased in Ammo Knights, having their own separate weapon selection. The following is a list of all available weapons in local Salmon Run. A crew of workers in Salmon Run. Workers storing the Salmonids' Golden Eggs. Inklings wearing the Salmon Run uniform. An Inkling girl wearing uniform. Mr. Grizz speaking to the workers. An Inkling girl in Salmon Run gear. Art of a work crew. The weapon selection menu for Salmon Run in The Shoal. A front and back view of the uniform. An Inkling riding on a Ride rail towards the Egg basket. An Inkling shooting a Propeller. An Inkling running from a Steel Eel. A team of Inklings fending off some Chum. An overview of the Ruins of Ark Polaris. On 21 July 2018, Splatoon 2's one-year anniversary, a Salmon Run shift took place in Spawning Grounds with Splattershot Jr., Splat Dualies, Splat Roller and Splat Charger. This is identical to the first ever Salmon Run Rotation that took place on 21 July 2017. The same stage and weapons were also used in a shift that took place on 24 December 2017, for Christmas. All rare weapons, except the Grizzco Slosher, have prescription medication containers attached to them. Rare weapon Hazard Level MAX!! Dutch Max. risiconiveau! Max(imum) risk level! French (NOE) Danger MAXIMUM ! MAXIMUM danger! German Maximale Gefahr! Maximum Danger! Italian Rischio Massimo! Maximum Risk! Slozhnee nekuda! It can't be even harder! Spanish (NOE) ¡Riesgo máximo! Maximum risk! ↑ Nintendo Treehouse Log. Salmon in the Summer. 2017-06-14, retrieved 2017-06-15. This page was last edited on 1 April 2019, at 20:58. This page has been accessed 390,895 times.